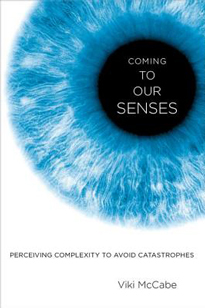 Cognitive scientist Viki McCabe is the author of Coming to Our Senses (2014), a book in which she argues that prevailing theories of perception, cognition, and information cannot explain how we know the world around us. McCabe shows that ecological disasters, political paralysis, and economic failures originate in our tendency to use mechanistic theories that reduce the world to extractable parts. But the world - from cells to cities - does not function as an assembly of parts. Instead, it is a coalition of complex systems. Each system reveals itself in fractal-like geometric configurations based on its structural organization. The book challenges how readers perceive the world yet it is eminently readable and compelling. McCabe is also joint editor of Event Cognition: An Ecological Perspective (1986, Kindle edt. 2014).